Waterfalls are places where a river plunges vertically for some distance, ranging from only a few meters to nearly 980 meters (more than 3,200 feet). A cascade occurs where the drop is not vertical and the stream pours steeply over the underlying rocks. A rapids is usually a lesser drop where the water churns over shallow rocks, flowing more rapidly than in the pools both above and below the fast water. The pounding of the water at the base of a waterfall is a powerful force for erosion, especially if the water contains suspended sediment . Even at the lip of the fall, the water gains extra erosive power as it accelerates approaching the brink. For this reason, waterfalls are temporary phenomena, geologically speaking. While the surging water tears away at the base of the falls, removing its rock foundations, the scouring of the lip grinds back the brink of the falls, decreasing the overall height. In some cases, the removal of the underlying rock leads to a collapse of the lip itself. The time it takes for these processes to erode the river bed to a gentle slope depends on the volume of water flowing over the drop, the amount of sediment available to grind away the bed, and the hardness of the rock over which the river flows. Even waterfalls on smaller rivers can last for millions of years. This is also true of large rivers where the bedrock is resistant to erosion. But in geologic terms, waterfalls are quite temporary, and their presence is a sure sign of the special geologic conditions that produced them. In a sense, they are like the flip side of lakes, which are also temporary, mostly because lakes gradually fill with sediment and eventually turn into marsh and meadow. Differential erosion of valleys, especially in glaciated areas. In all cases, where a major river plunges over a waterfall, geological processes must have been active within the past few million years. Rarely are large waterfalls older than a few tens of millions of years, and most are less than a million years old. Invariably the rock at the crest of the falls is one of the harder varieties, resisting the downcutting effects of the river. 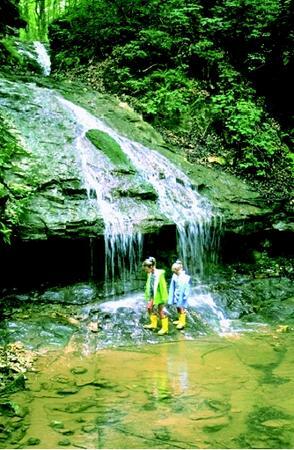 Although large waterfalls are better known, small falls are more commonly experienced by local and regional residents. This small cascade tumbles over resistant bedrock in southern Indiana. basaltic rock over which it flows. At the edge of the basalt, the river has eroded away softer layers below and has gradually carved a canyon upstream into the basalts. The fracturing of the basalts is most intense in two nearly (but not quite) parallel directions, and the river has cut a zigzag path working upstream, first along one direction of weakness, then the other. Presently it appears to be just at the point where it will take another sharp bend. Other examples of waterfalls produced by uplift of plateaus include Angel Falls in Venezuela—the highest in the world at 977 meters (3,212 feet)—and the collection of smaller waterfalls along the "fall line" at the eastern edge of the Appalachian Mountains. Situated on the border of Brazil, Argentina, and Paraguay, Iguazu Falls consists of 275 cascades spread across nearly 3.3 kilometers (2 miles). With an average (nonflood) discharge of 1,700 cubic meters per second (60,000 cubic feet per second), these falls are among the most powerful in the world. Away from the Niagara escarpment, the hard dolomite shielded the underlying soft shales from erosion. Flowpaths beyond the escarpment traversed areas not protected by this dolomite cap, and hence gradually eroded the underlying glacial deposits. Over thousands of years, the differential erosion created a vertical waterfall. It is estimated that 12,000 years ago, the falls were 11 kilometers (7 miles) downstream from their present position. The continuous removal of the shales at the base of the falls has steadily undermined the dolomite cap, causing its collapse and hence the ongoing retreat of the falls upstream. Today the erosion continues, but human modifications of the river's flow have reduced the erosion rate. Probably the best example of the last type of waterfall is Yosemite Falls in California. Yosemite Falls (and many of the other famous waterfalls in Yosemite National Park) is the result of the powerful erosion of Yosemite Valley by a glacier flowing down from the High Sierra. The glacier in the main valley was larger, and especially thicker, than the tributary glaciers that flowed into it. The thick ice stream carved a deep, flat-floored valley, and was much more effective in doing this than the smaller, thin tributary ice streams. When the ice melted away, the result of the differential erosion between the main and tributary glaciers left the floors of the smaller glacial valleys perched high above the main valley floor. Rivers such as the Yosemite now leap over immense drops to meet the Merced River, which flows at the bottom of the main valley. In all of these examples, the geologic activity producing the waterfalls is quite recent—perhaps 10,000 to 15,000 years for Niagara Falls and Yosemite, and probably somewhat longer in the case of Victoria Falls. However, the uplift of east Africa still may be occurring, likely at a rate of 2 to 3 centimeters (about 1 inch) each year. Without active geologic change, whether variations in climate as in the case of ice ages, or the slow, but inexorable motions of plate tectonics , waterfalls would soon cease to be part of the landscape. Their beauty is a combination of their ephemeral nature, the magnificence of motion painted in the air, and the insight they provide into the underlying working of the Earth. SEE ALSO Stream Channel Development ; Stream Erosion and Landscape Development. Goss, Dean. Waterfalls of the World: The Waterfalls Encyclopedia. <http://www.geocities.com/earthwater_1999/index.html> . Waterfalls of the Pacific Northwest. <http://www.waterfallsnorthwest.com> . * See "Great Lakes" for a photograph of Niagara Falls (the Canadian Falls).